The end of True Blood season 5 is drawing near and things are definitely heating up. On last week’s episode, we saw the Vampire Authority get even crazier and continue their plans to rule the world; we saw Bill undergo a rather drastic change of heart and fully embrace the blood of Lilith; and, on the home front of Bon Temps, the hate-crime group known as the Obamas was finally stopped with the help of Sheriff Andy, Jason, Luna, and Sam. Last week’s episode ended on rather unfortunate note, with Eric in handcuffs and Bill beside Salome, and after watching the spoilers and teasers the situation involving the Vampire Authority is only going to get worse. If you’re one of those people that gets physically ill from juicy spoilers, then shield your eyes now. However, if you need your True Blood fix a couple days early and need a few scenes from episode #10 “Gone, Gone, Gone,” which will air this Sunday, August 12 . . . then pull out those fangs and sink in! If you missed last week’s episode and want to get caught up, click here for our full-episode, scene-by-scene recap. For CDL’s top 5 hilarious moments from last week’s episode, click here. The thing that has us most intrigued about this upcoming episode is the mysterious scroll that Jason allegedly stumbles across. 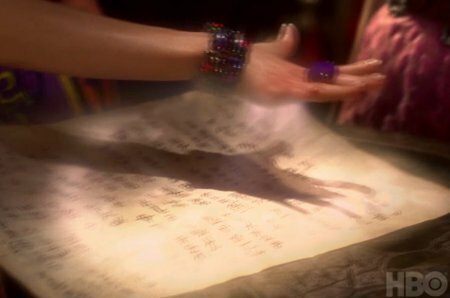 Perhaps it’s an ancient fae scroll or something that has to do with the myth/legend of Lilith . . . whatever kind of writings the manuscript holds, in the official preview we see some super intense fairy-finger-light scanning the document. Not sure what the fae would be scanning for — maybe fairy juice residue. Other spoilers revealed from the preview: Russell will try to turn the Vampire Authority on Sookie Stackhouse, bribing them with the idea that, if they drink her fae blood, they’ll be able to walk in the sunlight again; Pam, the passive aggressive person that she is, seems to be bowing down to Elijah — though, with Tara by her side, we’re anxious to see how long Elijah’s mandate will hold up; Luna is fed up with hiding in the shadows and threatens to tell everyone about supes; and Eric welcomes the True Death, as he’s adamant that he will not accept Lilith’s gospel. Jason and Jessica both run into each other at Merlotte’s; they say they’re both there to meet someone . . . and then Hoyt walks in *OH SNAP* What does he want to talk to them about? Is he going to wash his hands clean of both of them? Is he going to forgive them both? I hope it’s the latter. I’m getting very tired of Hoyt’s sulkiness . . .
And there we have it! Those are all the spoilers/teasers you’re getting. We can’t wait to watch the show. Make sure you tune in to watch it with us on Sunday when we’ll be LIVE blogging the episode!